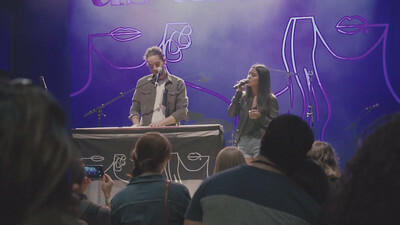 The duet known as Us The Duo consisting of a husband and wife, respectively Michael and Carissa Alvarado, came to fame not just through their covers from YouTube like your typical "YouTubers", but through performing unique eight second video clips of musical cover just showing only the bottom half of their faces. The fact that they were able to capture the hearts of fans around the world just keeping their identity mysterious for a short while and by eight seconds of a music piece is amazing. That shows how creative musicians have to be to draw viewers to their music. 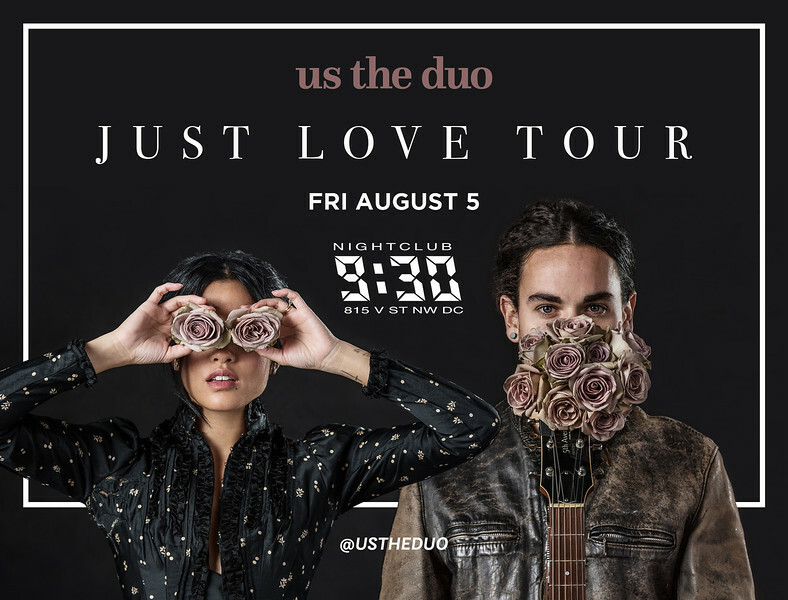 As a couple and musical duet, it was their third show in Washington DC to promote their latest and third album called "Just Love" independently produced by them. This was also my third time seeing these two perform live as well as meeting them in person. The mix of their goofiness and down to Earth personalities is what draws me and a lot of their fans wanting more. It's just amazing that they continue to recognize me by name and by face (and now also by friends that I also know). That's right.. how special is it when the artists you support remembers you when a friend goes see them in a different city without you even present? Pretty damn special. 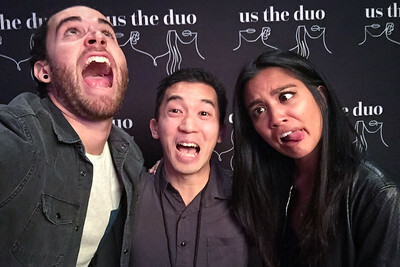 I was pretty excited to hear the news when Us The Duo was working on releasing a new album scheduled for middle of this year and soon after releasing a statement about a new tour to promote their new album. Their new album was released just weeks before they started touring, so I decided to wait and purchase the "Just Love" album when I see them at the show. That way, they can both sign it at the meet and greet. As soon as the released tickets for the show and VIP tickets, I rush on purchasing them back in May. DC was one of their pit stops a couple years ago when I last saw them at 9:30 Club. Last time I met and saw them live, I emailed their management team requesting a photo pass but was unsuccessful, so I didn't bring my camera. Michael and Carissa last time at the meet and greet mentioned that they love the pictures I took the first time I saw them live. They told me to just bring my camera next time, and they can and will make it happen. This was another reason why I wanted to get VIP tickets again, so that I can personally ask them about taking photos for them. On the day of the show, I left work early to avoid traffic since it was a Friday night show. I had to get there at 9:30 Club by 5:15pm for the VIP experience package. I, initially, wanted to get parking tickets to park at 9:30 Club's private fenced parking, but for some reason, I missed it when I purchased the tickets. So, instead, I got tickets to park at the visitor parking at Howard Hospital. It wasn't too bad since it was just two blocks away, and I was able to purchase it for $14 from 3pm Friday until 3pm Saturday; just $2 more expensive for 24 hour parking. I arrived at the Howard Hospital visitor parking at around 3:30 pm, then made my way to the music venue. I was pretty much the first person there, so I sat down near the will call office and started listening to Us The Duo's new album which was just released on Spotify that same day. 5:15 pm rolled around, and Us The Duo's VIP representative came out to check me and others in who had purchased VIP tickets. I was handed a wristband (pre-show performance and Q&A), VIP lanyard (meet and greet), and a happy face sticker (selfie package); the whole package. After everyone with VIP was checked in, we were brought inside 9:30 Club to start the VIP experience. Since I bought the whole package, I'll be able to explain each step of the way. First off, we were told to head into the stage where Michael and Carissa was waiting to perform one song that wasn't on their setlist for their DC show. As I walked into the room and up front and center, two couple noticed me and waved at me out of recognition. They performed "Take Me Home" from their debut album called "Us". After they finished their special pre-show performance, they sat down with all the VIP ticket holders to do a questions and answers session and interact intimately with their fans. Once the first leg of the VIP experience ended, it was time to line up for the meet and greet. After the wait in line, it was my turn for the meet and greet with selfie part of the VIP and as Michael and Carissa look over to see who's next, their reactions changed to excitement and enthused that I came to see them again. They thanked me for coming to see them and how great it is to see me again. They both gave me a hug. I was told by their VIP team that during this time, we need to limit talking to them so the line moves quickly until merchandise signing. So I quickly pulled out my phone for my selfie pictures. Carissa said let's have Michael take the selfies since his arm is longer than both of us. He was great and took several pictures. One that was serious and a few that that was goofy. Once selfies were done, we all took a meet and greet professional photo taken by their VIP team. After the picture taking was done, I asked them if they remember last time they asked me to bring my camera regardless, and they can make it happen to get a photo pass. They responded with an 'of course'. They said we'll handle it and said they'll have their team get a photo pass for me saying that I'm a great photographer. So again, I'm back in line and for the last leg of the VIP experience. I stand in line with my friend, Simon, for the merchandise signing. We decide to let everyone get ahead of us, and try be the last people there, so we can try to get a bit longer to talk to them without being rushed. In line waiting, we discuss how Michael and Carissa was able to recognize that I was friends with Simon when we both never seen the Michael and Carissa together yet. I tell Simon that I'm going to ask them how they know that he and I are friends. As the line finally approaches and it's our turn to see the couple again to get items signed, we approached the merchandise booth to buy their newest album "Just Love", so both Michael and Carissa can sign it. Before we start the signing session and before I let Michael and Carissa talk, I told them I had one question which I'm so intrigued to ask. I asked him how were they able to connect Simon to me when he went to their last show in Maryland when I wasn't there and never went together to see them until this show. Before Michael and Carissa responded, they pondered for a bit, thinking really hard how they know, and responded by saying that they think it was from Twitter. At first, I was uncertain how Twitter could link the two of us as friends, but after a while Simon and I figured it out. It was probably when I mentioned to the couple to say hi to Simon for me when Simon saw them in Maryland earlier that year. If that's the case, Michael and Carissa has such good memory. Simon then pulls out the figurines that he promise both of them he would make from their last show. The couple were shocked and awed by how much detail Simon put into the figurines. He then also pulled out accessories like keyboard piano and drums for the figurines. They were blown away of how cool they look. We get our things signed and I sneak in a picture of Michael, Carissa, and I from two years back from 9:30 Club for them to also sign. Before leaving the meet and greet, I remind them about the photo pass they were going to get me. They said, oh yeah, no problem, their management will get a hold of one, and give it to me before the show starts. After the VIP experience was complete, Simon and I go put away all our stuff from the meet and greet away in our cars and re-enter from the back room where the rest of the VIP individuals are chilling and waiting. As we wait, we meet a nice couple from New Jersey who travelled all the way to Washington, DC to see Us The Duo. We chat about Michael and Carissa, what they've done so far in the area, and what there is to do around the area. 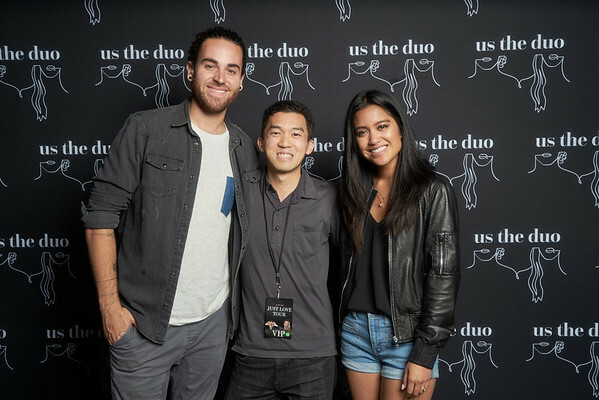 Just before we about to head back to the stage area to claim our our standing area, Us The Duo's VIP representative found me and handed me the photo pass for the show, so I could take pictures of Michael and Carissa in the pit for the first three songs. The VIP individuals as well as myself finally are able to get in the stage area before doors open for the general admission ticket holders. 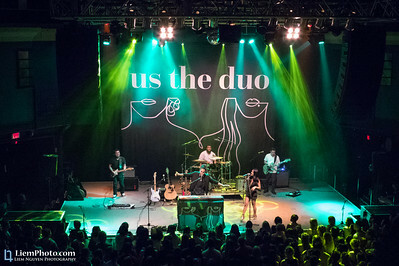 Even though we were able to head into the stage area, it will still a long wait until Us The Duo, let alone the opening act, starts their sets. This is probably the latest show I've been to ever. 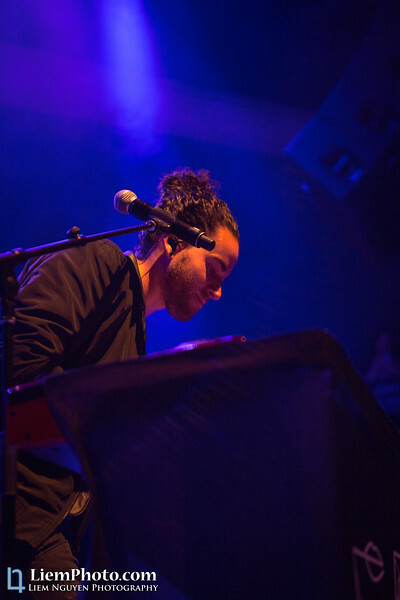 Doors opens at 8 pm, opening act starts at 9:15 pm, and Us The Duo starts at after 10:15 pm. I'm not sure why the show started so late; although, my suspicion is because it's a Friday night, and they are trying to make sure everyone can make it to the venue during or after the traffic rush. After many hours of already standing since 5 pm, the show finally starts with the opening act. The show opens with a group called Gardiner Sisters. This group consists of three sisters: Hailey, Allie, and Mandi. They perform for the first hour to warm up the crowd for Us The Duo. 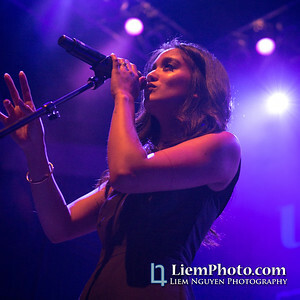 They perform some of their originals and a few covers. The crowd probably could be a split 50-50 for half the crowd coming to the Sisters and half coming to watch Us The Duo, but regardless who came to attend the show, they were excited about Us The Duo. After the opening act finished performing their set, I make my way up next to the pit in front of the stage to prepare myself to get on as soon as they come on. Since I'm only able to shoot photos for the first three songs, that doesn't give me much time. That's about 9-15 minutes to take pictures. As we continued to wait, I suppose the crowd started to get bored because they started to cheer on this guy who was wearing a 9:30 Club Extras shirt. He was helping to set up equipment for Us The Duo. Everytime he came on stage, everyone would cheer and yell loudly for him, but no one cheered for anyone else helping to set up. 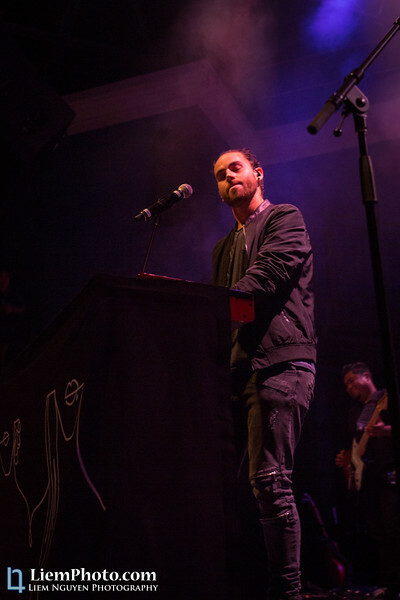 Later, I find out that he's the drummer for Us The Duo. So, I wasn't entirely sure if they were cheering him on for the shirt he was wearing, him being the Duo's drummer, or both. 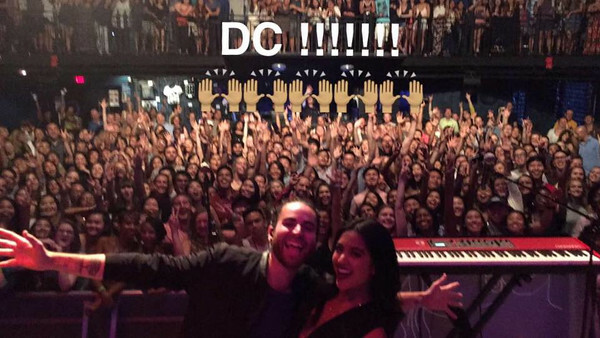 Us The Duo finally takes the stage some time after 10:15 pm for their headlining act in DC with their band. This was the first time they ever went on tour with a full band. I start to rush in with three other photographers to take photos for Michael and Carissa. Throughout the first three songs, all the photographers as well as myself squirm around the small pit avoiding any trips and falls to try to take the best pictures we can take. Both Michael and Carissa come on stage with the biggest smiles on their faces like they were ready to take the house down. For the next couple of hours, fans also known as Us The Family got to see these two perform for the first time or see them perform again. Having a full band definitely made all the songs they performed more upbeat, and you can see people singing and dancing along. 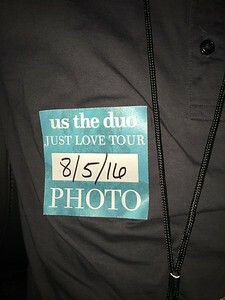 They performed songs from their newest album "Just Love" as well as their older albums "No Matter Where You Are" and "Us". They also covered a few songs and stripped some of their songs down to purely acoustic. If their fans, left the show unsatisfied and wanting a refund, then something is wrong because Michael and Carissa put on a show of a lifetime once again. After my three songs ended for the photoshoot, I walked out the pit, walked around, and started taking some wide angle photos from afar with my point and shoot and phone cameras. Lastly, I had to enjoy the show too. These two are very adorable on and off the stage as well as musically complementing each other. As each of their voices make the songs more complete than without one of them. During the show, Michael and Carissa did take a picture of themselves and the crowd to post on their social media pages. To see the pictures I took at the DC show, see the slideshow below or click on the link below the slideshow. 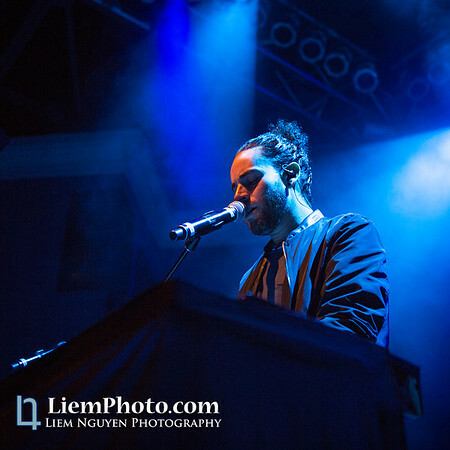 Since nothing really happened after the show other than everyone rushing out of 9:30 Club to head home when it ended after midnight, I will change it up a bit and talk a little bit about the encore of the show for Us The Duoin this section of the blog. After Michael and Carissa left the stage to a roaring crowd, everyone cheers for "one more song" or "encore". 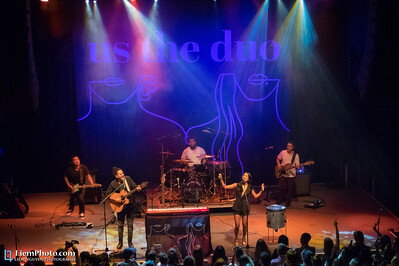 After everyone yelled their hearts out, Us The Duo comes back out with their band. They come out to perform not one, but two more songs! They close out this unbelievable show by covering their rendition of "September" by Earth, Wind, and Fire. 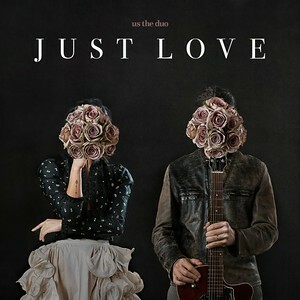 Lastly, they end the night with their latest single from their newest album, "(Stop) Just Love". Once the song ends, they thank the band, the venue, the Gardiner Sisters, and everyone for supporting, helping, and coming to the show. The lights then goes out for the night. I was able to capture both encore performances. You can watch them below. 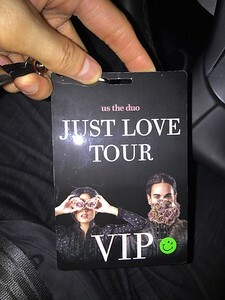 Another great tour put on by Michael and Carissa Alvarado from Us The Duo. A successful performance with their full band which has never been done before outside of their home town. To end the blog, I'd like to personally thank both Michael, Carissa Alvarado, and their management team for the opportunity, last second, for the photo pass to take pictures of both of you during this part of the tour. 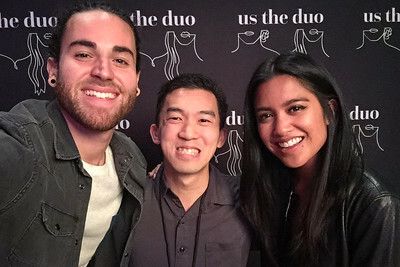 If you’re interested to know more about Michael and Carissa Alvarado from Us The Duo and would like hear more music by them, please do check out their website and social network pages below. As always, go out and support these artists by going to her shows and buying their music.